100 two-ply sheets. 65 sq ft. 10.9 in x 8.6 in. Stronger: Interlocking fibers ensure extra strength and durability. Our Fiberlock technology stands up to the toughest jobs. Maximum Absorbency: Technologically formulated fibers soak up more liquids. This makes cleaning up easier. 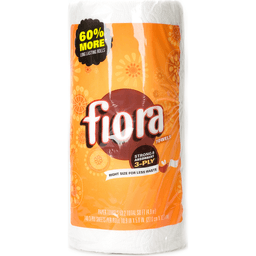 More Durable: Each towel is made from our ultra durable fibers. These fibers allow you to wet, rinse, wring, and scrub. Now with Fiberlock technology. 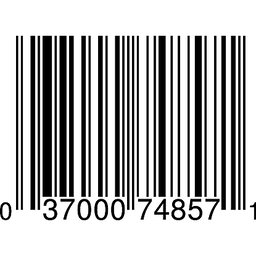 Manufactured in USA from domestic and imported materials. 140 3-ply sheets per roll. 10.9 in x 5 in (27.8 cm x 12.7 cm). 319.2 total sq ft (29.7 m2). Strong & absorbent. More: The longest regular roll. Right size. Strong. Thick. Absorbent. Inside you'll find a different kind of towel. 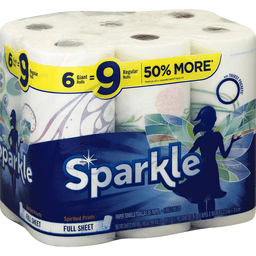 Packed with 3-ply strength and absorbency - and lots of it. In fact, it's the longest regular roll out there. With right-size sheets for less waste, it's great for everyday cleanups. And because we focus on what's truly important, we find the happy wherever we are. 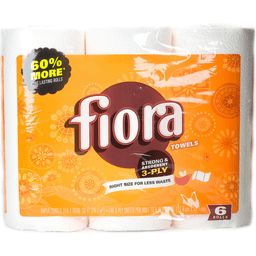 We hope a little bit of that makes it into every roll of Fiora. Stay bright. Facebook: Fiorabrand. Stay-bright.com. PEFC certified. This product is from sustainably managed forests and controlled sources. www.pefc.org. Plus-sized and proud. The longest regular roll. 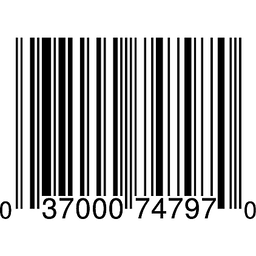 Manufactured in the USA from domestic and imported materials. Don’t let spills and messes get in your way. Lock in confidence with Bounty, the Quicker Picker Upper*. This pack contains Bounty white full sheet paper towels that are 2X more absorbent* and strong when wet, so you can get the job done quickly. 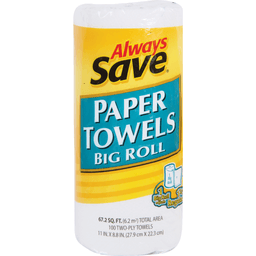 Bounty paper towels also can last longer*, so you can change the roll less often! 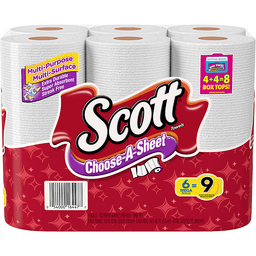 *vs. leading ordinary brand Pack contains 2 Huge Rolls of Bounty white Full Size paper towels Each Huge Roll contains 150% more sheets than a Regular Roll Bounty, the Quicker Picker Upper* * vs. leading ordinary brand One roll can last 50% longer! 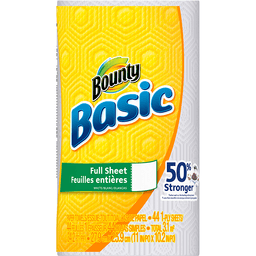 * *vs. leading ordinary brand Try Bounty Napkins! Don’t let spills and messes get in your way. 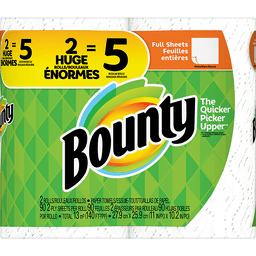 Lock in confidence with Bounty, the Quicker Picker Upper*. 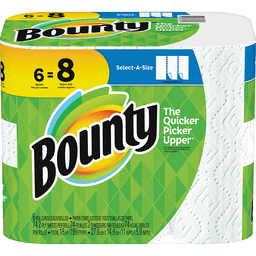 This pack contains Bounty white Select-A-Size paper towels that are 2X more absorbent** and strong when wet, so you can get the job done quickly. 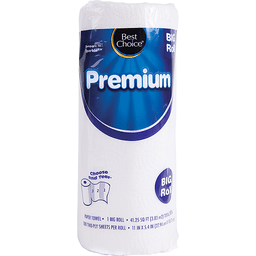 **vs. the Custom-Size-It brand in the US and the Premium Green Leaf Towel in Canada*vs. leading ordinary brand Pack contains 8 Giant Rolls of Bounty Select-A-Size white paper towels Each Giant Roll contains 50% more sheets than a Regular Roll Bounty, the Quicker Picker Upper* * vs. leading ordinary brand 2X More Absorbent* *vs. the Custom-Size-It brand in the US and the Premium Green Leaf Towel in Canada Also available in fun prints! 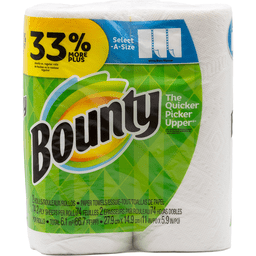 Try Bounty Napkins! Don’t let spills and messes get in your way. 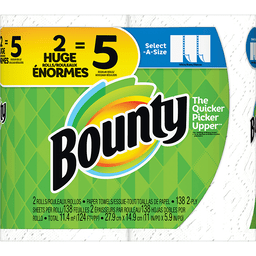 Lock in confidence with Bounty, the Quicker Picker Upper*. 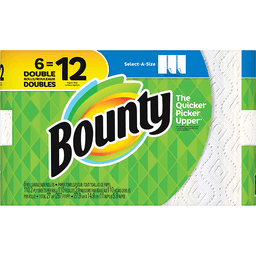 This pack contains Bounty white Select-A-Size paper towels that are 2X more absorbent** and strong when wet, so you can get the job done quickly. 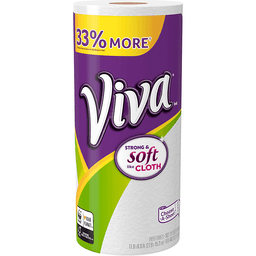 **vs. the Custom-Size-It brand in the US and the Premium Green Leaf Towel in Canada, *vs. leading ordinary brand Pack contains 12 Big Rolls of Bounty white Select-A-Size paper towels Each Big Roll contains 33% more sheets than a Regular Roll Bounty, the Quicker Picker Upper* *vs. leading ordinary brand; 2X More Absorbent* *vs. the Custom-Size-It brand in the US and the Premium Green Leaf Towel in Canada Try Bounty Napkins! 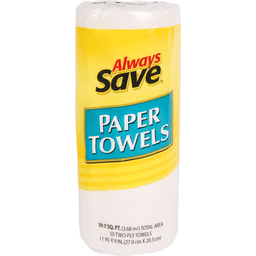 Bargain-brand paper towels letting you down? 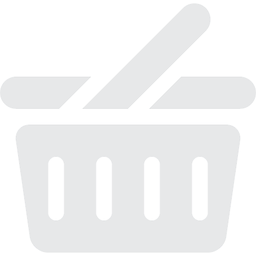 Bounty Essentials is the deal that holds up*. 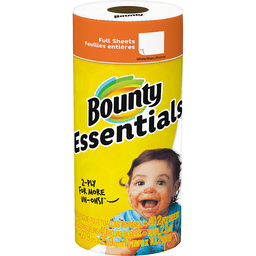 This pack contains Bounty Essentials white Select-A-Size paper towels that are strong enough to handle life’s everyday spills and messes, and are affordably priced. 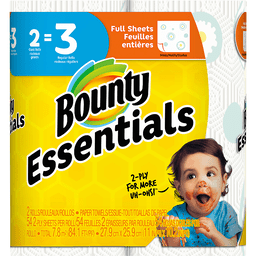 Bounty Essentials Select-A-Size sheets also allow you to control just how much you use depending on the size of the mess. Choose Bounty Essentials, the affordable paper towel that holds up for more of life’s “uh-ohs!”, *when wet vs. leading ordinary brand Pack contains 6 Big rolls of white Bounty Essentials Select-A-Size paper towels Each Big Roll contains 33% more sheets than a Regular Roll Affordably priced 2-ply paper towel! ; Holds up to more Uh-Ohs Also available in fun prints! 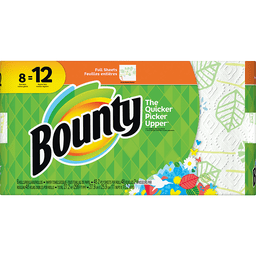 ; For tougher messes, try Bounty in the green pack! 261.8 sq ft (24.3 sq m). 11 in x 10.2 in (27.9 cm x 25.9 cm). 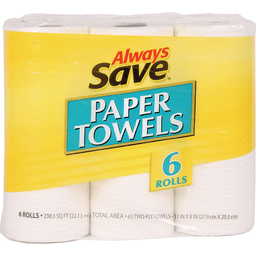 6 large rolls = 8 brawny regular rolls. 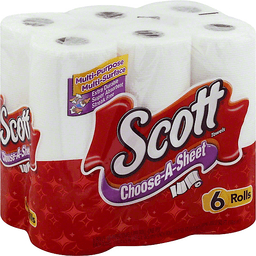 56 2-ply sheets per roll. More feet! 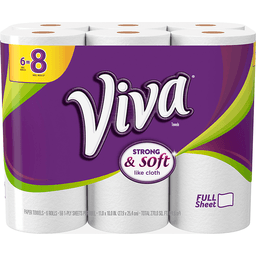 vs leading nat'l brand 6 roll/54 sheets and now stronger than before. The strength to take on tough messes. 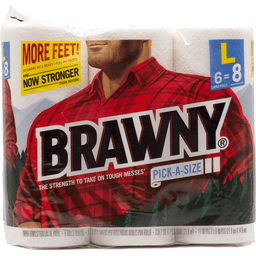 Since 1974, the Brawny brand has been an American icon of strength and durability. It is the original, big, tough towel. Made to be gentle. But engineered to handle the tough messes life can dish out. Giving you the confidence to accept all challenges. Allowing you to meet the worst moments with your best self. So, stay strong. Stay resilient. Stay giant. Proudly supporting American jobs. 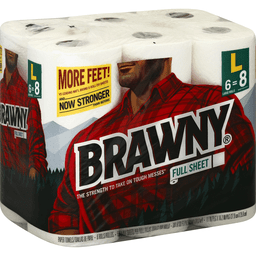 Visit our website at: www.brawny.com. how2recycle.info. Don’t let spills and messes get in your way. 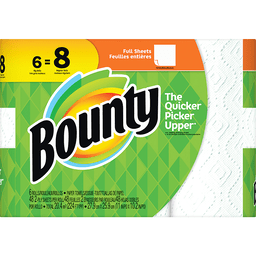 Lock in confidence with Bounty, the Quicker Picker Upper*. 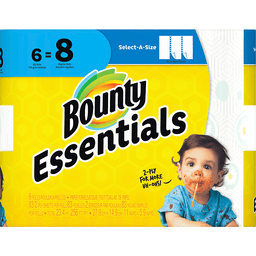 This pack contains Bounty Select-A-Size printed paper towels that are 2X more absorbent* * and strong when wet, so you can get the job done quickly. 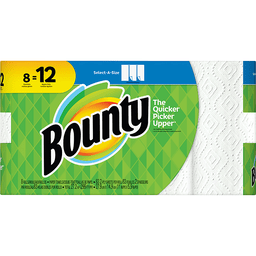 Bounty’s printed paper towel designs are sure to brighten up any room in your home! **vs. the Custom-Size-It brand in the US and the Premium Green Leaf Towel in Canada*vs. leading ordinary brand Pack contains 8 Giant Rolls of Bounty Select-A-Size printed paper towels Each Giant Roll contains 50% more sheets than a Regular Roll Bounty, the Quicker Picker Upper* * vs. leading ordinary brand 2X More Absorbent* *vs. the Custom-Size-It brand in the US and the Premium Green Leaf Towel in Canada Try Bounty Napkins! 44 1-ply sheets. Total 34.2 square ft (3.1 square m). 11 in x 10.2 in (27.9 cm x 25.9 cm). 50% stronger (when wet vs. the leading ordinary brand). Questions? Comments? Call 1-800-9-Bounty. www.BountyTowels.com. Good housekeeping since 1909. Limited warranty to consumers. Replacement or refund if defective. www.pg.com. Made in the USA from domestic and imported materials.